This Persistence Market Research report examines the global ID card printers market for the period 2017–2025. ID card printer is defined as an electronic device designed specifically for printing of ID cards. The working principle and built of a ID printer is slightly different from computer printers as it uses a superior and long lasting quality for the ID cards in the global market. ID card printers usually do not have programmable logic controllers on its own, but rely on an external computer system. In order to have an ease of understanding and for the better organization of the report, the report on global ID card printers market has been divided into four distinct parts. The first part of the report contains the introduction section that contains the executive summary of the report along with the market taxonomy and the definition of ID card printers. This valuable section of the report also contains information on the market viewpoint of the global ID card printers market and the macroeconomic factors affecting this market. In addition, pricing analysis of the global ID card printers market along with the value chain analysis for this market is also given in this section. Porter’s Five Force analysis is also given for this market. Besides this, the first section of the report also contains the market dynamics of the global ID card printers market in the form of comprehensive listing of the drivers, restraints, opportunities and trends operating in this market. The second part of the report contains the global ID card printers market analysis and forecast by product type, communication interface, technology, end use, sales channel and by region. This section of the report contains important market numbers in the form of market attractiveness index, incremental dollar opportunity and basis point share analysis. The third part of the report contains the regional ID card printers market analysis and the regions are chosen as per the market taxonomy. In this section of the report, the regional market numbers are discussed in detail. The last part of the report features the competition landscape of the global ID card printers market and has information on the key players operating in this market. The competition landscape contains detailed information on the important companies operating in the global ID card printers market in the form of company description, product overview, key developments, strategic overview and key financials of each of the featured companies along with the SWOT analysis of the companies. This competition landscape is a valuable part of the report as it contains all the necessary information to study the leading companies operating in the global ID card printers market. Overall market size has been analyzed through historical data, primary responses, and public domain data. Revenue of companies in the global ID card printers market has been benchmarked to ascertain the market size for the base year. Macroeconomic indicators such as GDP and industry growth have been considered to forecast the market size over the forecast period. The historical growth trend of end-use industries, market participants’ performance, as well as the present macro-economic outlook has been taken into consideration for estimating the overall market trend forecast. This data is then validated using the triangulation method and is extensively scrutinized using advanced tools to garner quantitative and qualitative insights into the global ID card printers market. Growth in the manufacturing sector is slowing down compared to the boom after the 2008 economic crisis; nevertheless, it is still growing steadily, albeit at a slower pace. Automation and streamlining of manufacturing processes are being adopted by a large number of manufacturing companies worldwide to reduce time and material wastage, thereby improving efficiency and output. The growth of the manufacturing industry is expected to rise, as there is a need for more advanced products and goods every day. The growth of the manufacturing sector in the global market is expected to create significant opportunities for the ID card printers over the forecast period. Additionally, the fabrication and manufacturing industry is estimated to witness a healthy CAGR over the forecast period and this in turn will propel the growth of the ID card printers market. Retailers in the global market are pushing for bringing about better point of sale and printing experience in an effort to speed up the entire manufacturing process. This has resulted in ID card printer manufacturers to move towards thermal printing solutions in the global market. A dynamic shift has been observed in the purchasing pattern of consumers in the global market, and they have been observed to incline towards end users providing high level of customer satisfaction. Hence, large scale end use industries are focused towards updating their ID cards for their employees with the latest as well as cost effective products available in the market. ID card printers are programed to operate on few user interface applications such as Windows and Linux; therefore, when an ID card printer is connected to a computer system that runs on these operating systems or any other operating system compatible with it, it functions smoothly. However, currently, with the number of computer operating systems increasing significantly, computer terminals adopted in various domains have different operating systems based on ease of usage and tasks necessary for the computer to carry out. This factor could prove to be a roadblock to growth of the ID card printers market because these are built and programed to be compatible with few operating systems owing to limitations of the memory system and programmable logic controllers inherent in such printers. 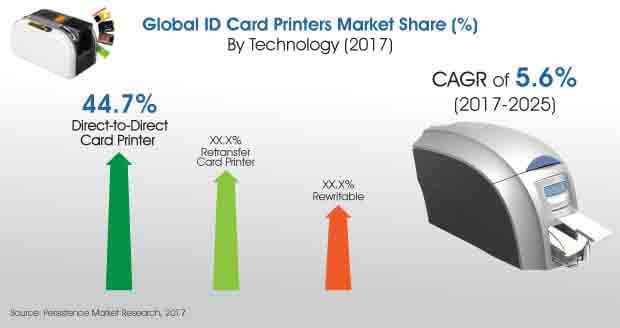 As per the forecasts provided by Persistent Market Research, the direct-to-direct card printer segment in the technology category was estimated to be valued nearly US$ 1,750 Mn in 2017 and is anticipated to touch a valuation of nearly US$ 2,800 Mn in 2025, reflecting a CAGR of 6.1% during the period of assessment 2017-2025. The rewriteable segment in the technology category was estimated to be valued at nearly US$ 660 Mn in 2017 and is forecasted to reach a valuation of nearly US$ 950 Mn in 2025, displaying a CAGR of 4.5% during the period of forecast.